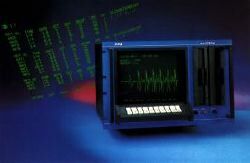 "Thanks to this mutant computer terminal cleverly disguised as an industrial-grade, rack-mounted video game, you could create new waveshapes by specifying points on a graph or by sampling acoustic sounds. You could display the resulting waveform on the Waveterm's CRT screen in order to perform a Fourier analysis. Still, the Waveterm was limited. 'It was only 8-bit and had quite limited memory,' Palm [Wolfgang, the man behind PPG] offers. The microprocessor chip used in the original waveterm (which later became known as the 'Waveterm A') was a 6809."